Gameday is here, Gator Nation! Despite some of my summer commentary about the state of the Gators, there is nothing like the start of the season to make you eager for the start of college football and see exactly what our team can do. Sure we don’t know who is starting at QB. Also we plan on playing at least 2 guys at QB…possibly more. We’re not sure if we can run the ball…or get it to our receivers. Heck, there are a ton of questions we have about this team. ISN”T IT GREAT!! I hope you’re as excited as I am, fellow Gators. Let’s talk some football…. The Bowling Green Falcons will be visiting the Swamp with great intentions. I’m sure they are hoping that our inability to select a QB will play in their favor of keeping it close until the end and maybe pulling off a miracle. They have some reason to be a bit confident rolling into Gainesville. They return 20 starters on their team…of course that team went 5-7 and played in the MAC….sooooooo I’m thinking that’s not necessarily the best thing. They do, however; bring in one significant trait that will be great for us. They love to air the ball out. If our secondary is as good as it is being advertised then we will know something about them tomorrow. If we have the capability of shutting down the pass and creating some turnovers, it’s going to be figured out pretty early tomorrow. As far as BG’s defense, all I know is that they gave a lot of points and about 400 yards a game in 7 losses last year. I’ll give them the benefit of the doubt that one year with quite a few returning starters will improve the defense some, but I’m expecting some points tomorrow regardless of who the QB may be. The Falcons QB is Matt Schilz and he passed for more yardage last year than John Brantley did the last two seasons…..more TDs as well. An experienced QB will go along way to making tomorrow an uncomfortable game. Of course, I’m expecting our defense to put that to rest very early. The Gator defense is the supposed strength of our team. If that is the case I’m assuming we shut down BGSU early and often. If we’re not getting turnovers then I want a ton of three and outs. I’ll take a blocked punt by our specials teams while I’m placing my order. Shoot, while I’m at it how ’bout a kickoff returned for a TD by the Andre Debose? I’ll take any option to scoring points this year. Likewise, I have big hopes for Mike Gillilee and until proven otherwise, I’m tuning in for a great viewing of The Mike Gillislee Show. If he’s the runner that we think he can be and with an improved O-Line then I want some yardage on the ground tomorrow. Sure, some downfield passing would be nice, but first and foremost our offensive line has got to raise up and place a mighty beast of burden on the BGSU defense. If we can’t shove them around then the SEC will be very interesting for our team. There’s a lot of hope in this post this week. If I knew more, I’d put it right here, but we start this season on equal footing and will have to go from there. Methinks Jacoby Brissett to start at QB. Florida 45 BGSU 13. Game time is 3:30pm EST, 12:30pm PST on ESPN—except here in Kuwait where it will be on Armed Forces Network-Atlantic at 10:30pm. I hope not to wake my neighbors with loud cheers. It’s easy to do when we’re National Championship contenders, but hopefully this week starts us off well and you find yourself at your local Gator Club where Victory is best served with Gators! ‘Nuff said. This entry was posted in Uncategorized and tagged Bowling Green Falcons, ESPNU, florida vs bowling green, University of Florida on August 31, 2012 by TheGatorNarrator. Glad they made the change between seasons. Always a good call with karma to avoid drastic changes mid-season. Nice logo. Never thought much of the field design, but if Boise State wants a blue field, I suppose a Gator head at mid-field is about right. 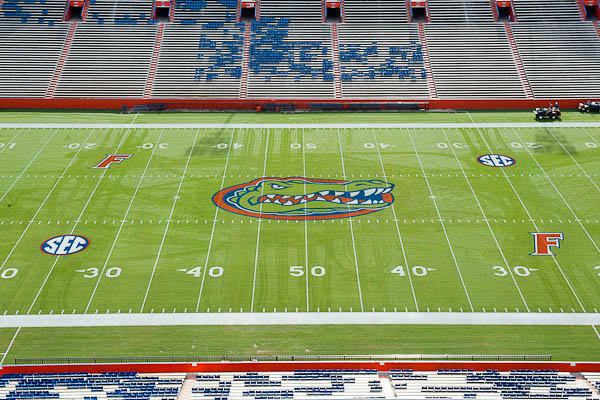 This entry was posted in Uncategorized and tagged florida field, Florida Gator, gator head logo, University of Florida on August 31, 2012 by TheGatorNarrator. That was a great teaser. How many of you actually came to this site thinking I had any clue on the offense at all? Truly…has anyone out there seen much in the way of information about our offense? Brent Pease came to the Gators via Boise State. This has been the oft-repeated statement regarding his offense “myriad of motions and shifts in the offense Pease brought with him from Boise State”. OKKKKKKK. We can shift, move, dance, sing and shout for joy, but it doesn’t matter much in the SEC if you can’t rise up off the offensive line and knock the intestines and entrails out of the defense. Apparently we’re also going to play two QBs because that’s going to work!!! I’m now officially voting for the Wildcat to open our season. I know, I know…I’m being very negative. Fact is we don’t know what to expect this year, but we do know it will be better. Our offensive line is deeper and we’re bringing at least one year’s worth of experience to a bunch of new faces. The offensive line is the key. If they can move some bodies around we’ll definitely be better than last year. Unfortunately, we just won’t know until this weekend. I’m somewhat giddy (no joke) to be able to see if The Mike Gillislee Show will be as I expect it to be. Giddy, I’m tellin’ ya. I’m saving some tidbits for the defense for this Friday’s post because it plays nicely on what to expect with Bowling Green this weekend. Needless, to say many think our defense will be the stuff of legends. I’m here to tell you right now, that we need significant improvement from last year before I buy into that. Where did our defense excel last year? Against an abysmal FSU team that would not have scored if we hadn’t given them the ball 3 feet from the goal line THREE TIMES? Against and even more abysmal Ohio State team that couldn’t move the ball against Big Ten defenses? Does anyone remember that Furman——FURMAN——scored 32 points against us very late in the season? All right, I can see you’re freaking out now. Don’t be. We have far more depth on defense than a year ago and I think we have better solidarity among the defenders. I think we will especially be good on pass defense, but if we are -12 in turnovers again then we are in for a long season. Ultimately, I have confidence in our defense this year. If we are to improve on last year’s performance it is going to be because of our defense. That’s it for now. More to follow and start making your plans to join your local Gator Club this weekend for the first game of the season where Victory is best served with Gators! ‘Nuff said. This entry was posted in Uncategorized and tagged Brent Pease, Florida Gator, University of Florida, Will Muschamp on August 28, 2012 by TheGatorNarrator. 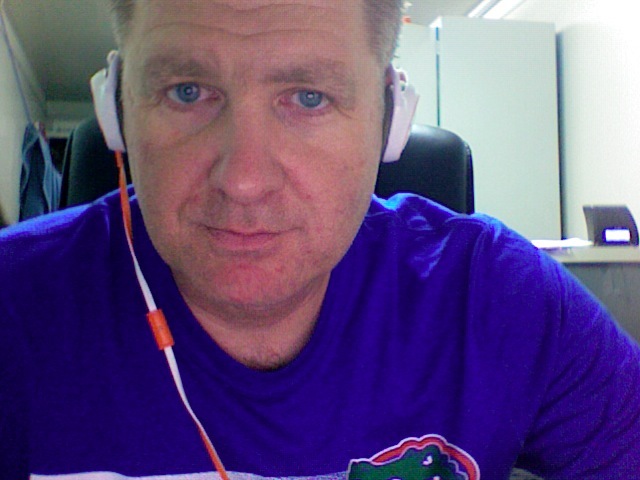 Even in the middle of Kuwait, I’m able to virtually attend my local Gator Club’s Kickoff Party. Here’s me in the middle of a Skype session with the Greater Columbus Gator Club and few of their members. A little Gator football talk and a little while just to catch up on things. Had a goal of “Be Back By Vandy” when I started this, but I think the most likely scenario is “Back Before Bowl Game”. Such is life. Thanks Kathy & Deena. Go Gators! This entry was posted in Uncategorized and tagged Columbus Gator Club, Florida Gators, Gator Club, Gator Kickoff Party, Kuwait on August 26, 2012 by TheGatorNarrator. Gotta love December, Gator Nation! So this matchup was named shortly after losses for both teams to their annual rivalry teams. Then Charlie Weis leaves after one year to go coach…..Kansas. I’m beginning to understand that coaching at Florida requires great intestinal fortitude…not great intestinal magnitude. Then we hear that Urban Meyer is named the coach at OSU and….living in Columbus, I can tell you…the crowd goes wild. The man they hated the most five years ago is now their savior of their storied program. Kind of funny if you think about. I hear that Urban Renewal shirts are very popular in Central Ohio. I’m wondering if they need to stock up on Urban Destruction shirts in a few years. I digress. Unlike seven years ago when Urban Meyer took over at UF, he was replete with talent left by Ron Zook. It was not so much rebuilding that he needed to do as it was re-tooling and changing mindsets. No doubt for four years he brought in quality talent, but what he left Will Muschamp with is clearly a lack of overall depth and talent….and he knew it. So he got out while the getting was good. A perennial record of 7-5 and 8-4 just wasn’t going to cut it with him. Funny how one year was all he needed away from the game to re-charge and get back in touch with the family. He will get OSU back to where it was with Tressel mainly built on the idea that they aren’t playing Alabama, Georgia, FSU and LSU every year. I thoroughly enjoyed our two Championship seasons and hope for more, but our next few years are going to be tough. Will Muschamp’s first season was average at best for the Gator Nation. I won’t go into depth on the parallels of the Ron Zook year’s but they are very glaring. I will concede at this point–having played the entire regular season–that he has extensively less talent than the Zooker when he took over from Meyer. That said, he has some very big difficulties ahead for him. He lost to UGA and FSU this year which will make recruiting that much harder. Losing to both those programs in your FIRST year impacts many things. For the Georgia series it means they have momentum now in the rivalry and….gasp….HOPE. It’s been a very long time since Georgia had any in this series. FSU now has a two game win streak on us. To top it all off, he will also be competing against Meyer in the state of Florida for recruiting. He has a very tough road ahead and, unfortunately, he has not demonstrated that he’s the X’s and O’s mind that can get us over the top. Charlie Weis was supposed to help him through these years and now he’s gone after one year. With a very thin offensive line and only two OL commits for next year, his next selection as O Coordinator better be good or the Gator Nation will get absolutely frenetic. Let’s turn our attention to the Ohio State Buckeyes. They lost their last three games of the season to Purdue, Penn State and Michigan. Two of which have good defenses and no offense and the latter of which has a tremendous offense but absolutely no defense. Our defense showed up against FSU. Unfortunately, our offense couldn’t produce much of anything. I don’t know if Brian White calling the offensive play will change anything, but I’m just going to assume that it can’t hurt. The big, glaring, elephant in the room stat that will absolutely almost positively guarantee (maybe) a win for us is NOT TURNING THE BALL OVER. That said, we didn’t have many games where we didn’t turn the ball over and forced the other teams into turnovers. It plainly is that simple. We hold onto the ball and force at least one turnover, we should win this game. OSU’s offense isn’t near the potency we saw of other teams this year, but their defense is definitely for real–when they want to be. Given they are riding a great wave of enthusiasm with the hiring of Meyer and with plenty of time to prepare I’d be very surprised if their defense doesn’t come ready to play. In the Meyer-era, when we had time off before a game we won every time except for once. So far, Muschamp is 0-1 against UGA. Here is his chance to break even. There shouldn’t even be a question of our motivation for this game given so much for the Gator Nation is riding on it. Florida 23 Ohio State 17. Game time is 1pm EDT, 10 am PDT on Monday, January 2nd on ESPN2. Happy New Year, Gator Nation! Let’s get 2012 started with a win and build some momentum for next season. I will be in pre-deployment training before heading over to the big sandbox for game day so I won’t be able to watch—and I won’t be in an area where I can get game updates on my phone. I’m hoping the day ends well tomorrow. Every other Gator on the other hand should stick to the old school adage “in all kinds of weather” and go to your local Gator Club because celebrating a Gator Bowl Victory over the Buckeyes is best served with Gators! ‘Nuff said. This entry was posted in Uncategorized and tagged Buckeyes vs Gators Jan 2012, Gator Narrator on August 24, 2012 by TheGatorNarrator.